30 Winners in 30 Days! Updated Sunday July 1, 2018 by Nashua Cal Ripken. Thank you to all players who sold calendars, and to all of those who bought them in support of our league. All winners have now been selected and are published below. 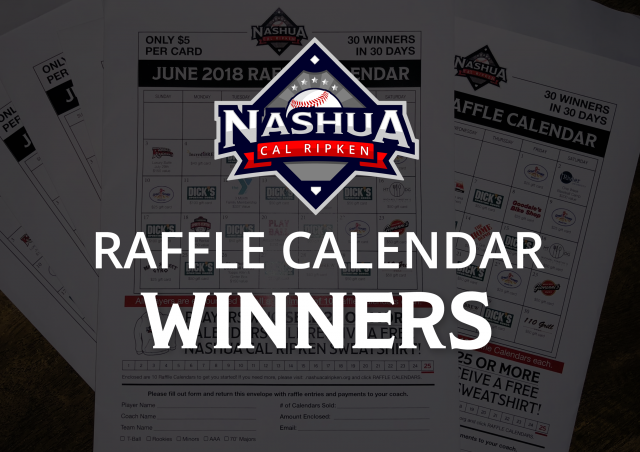 If you have won a raffle and have not been contacted by a league administrator, please reach out to fundraising@nashuacalripken.org. June 1st - $25 Great Harvest Bread Co.
June 9th - $25 Great Harvest Bread Co.
June 10th - $25 Great Harvest Bread Co.
June 22nd - Great Harvest Bread Co.